When Should You Service Your HVAC? You know that there are small maintenance things that need to be done all around your home. For example, you get your oil changed in your car, you check the smoke detectors, etc. However, we often neglect the things that are running smoothly, because, well, “if ain’t broke, don’t fix it.” However, when it comes to your HVAC, it’s much more important than you would expect to get it checked out and tuned up, even when it seems to be running perfectly! But how often do you need to service your air conditioning and heating unit? Ideally, you would be calling us each year to have your HVAC inspected, serviced, and cleaned once a year to make sure that it is running at its absolute best. Ideally, you should make this call in the spring in case we need to make major repairs. That way your unit will be ready to heat and cool your home in the months when you need it most! As your HVAC unit runs, it will gather dirt and general dust in the main areas it needs clean to run smoothly. For example, the condensing coils and air filters tend to get dirty and dusty quite easily. If your air conditioning unit is left unchecked, it can lose up to five percent of its operating efficiency every year it goes uncleaned simply because of the buildup. That means that your Pasco County home will rise in temperature as your utility bill increases since the system will need more energy to cool your home the same way it did before. Some places will offer maintenance contracts, so always ask about these services. For a small fee, these companies will usually clean and service your HVAC unit, as well as replace your air filter, each year. Of course, you can always call and make an appointment on your own when you need to. We know for a fact that HVAC inspections pay for themselves through increased energy efficiency. This means spending less money on bills! It also means that your air conditioning unit will last longer than it would without frequent repair and updates. You may be able to reduce your monthly energy bill by up to 15 percent and prevent totally HVAC breakdowns before you even begin to see signs of one. On the flip side, replacing your air conditioner can cost up to several thousand dollars. Even the smallest of repairs might cost about a few hundred dollars. However, a qualified technician will be able to spot small issues before they ever become an expensive problem. Your inspection should include checking the motor, the blower, drain line, operations pressures, coils, temperatures, return and supply lines, connections, and refrigerant levels. 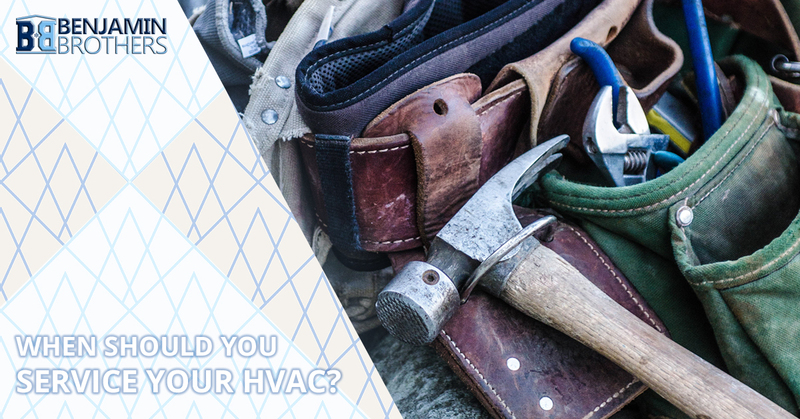 Should you choose to hire a company other than Benjamin Brothers, ensure that they are licensed as HVAC contractors. Not only that, but make sure the company holds workers’ compensation and liability insurance. The last thing you want to do is be left paying the medical bills of one of their employees should they get injured. If your HVAC system seems to be running just fine and your technician suggests an extremely expensive repair, don’t be afraid to seek out a second opinion. You can usually check with others to see if they find the same problem and if they think it is essential that you make the repair. You can expect your air conditioning unit to last you about 15 years, assuming that you take good care of it and get it inspected and cleaned regularly. With a passion for excellence and fair prices, Benjamin Brothers is the team to call when you are in need of HVAC maintenance, cleaning, or inspection. We can help you understand what is wrong with your HVAC, as well as help you make the right decision when it comes to either repair or replacement. If you are ready to experience true energy efficiency and comfort in your home, contact our team today! We look forward to providing your Pasco County home with the relief it needs. Benjamin Brothers is your top choice when it comes to HVAC installation and air conditioning repair! © 2017 Benjamin Brothers® - All rights reserved.